On our recent trip to self-charter a canal barge on the Canal du Midi in France, we stopped for a night in the lovely old Spanish town of Avila. 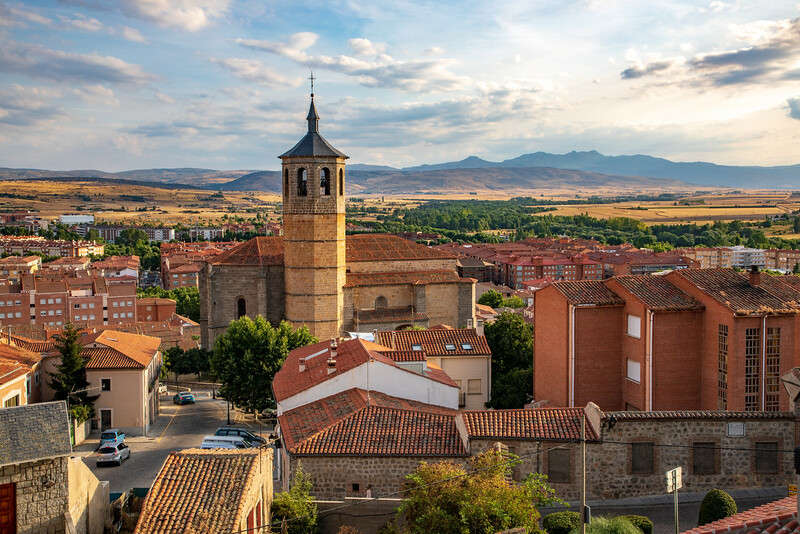 Avila, Spain, is located roughly halfway between Salamanca and Madrid and would make a great day trip from either of these cities. 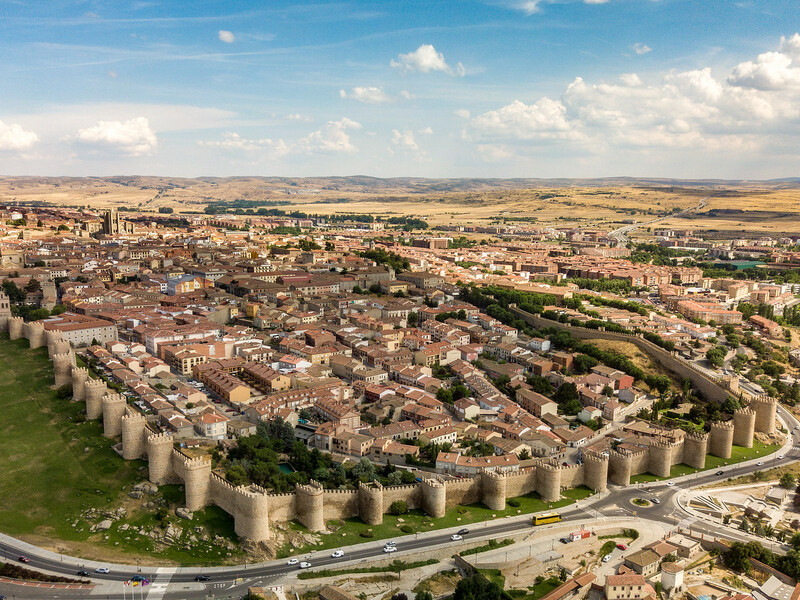 On your approach to the walled city of Ávila, there’s a viewpoint, the Cuatro Postes which offers a fantastic view of the city, its walls and towers. Easy to find, just look for the tourist buses, but even with the crowds, it really is worth stopping here. If you aren’t driving or on a tour, it’s just a 20-minute walk from the centre of Avila. The city of Ávila, Spain at 3,700 feet above sea level is the highest provincial capital in Spain. 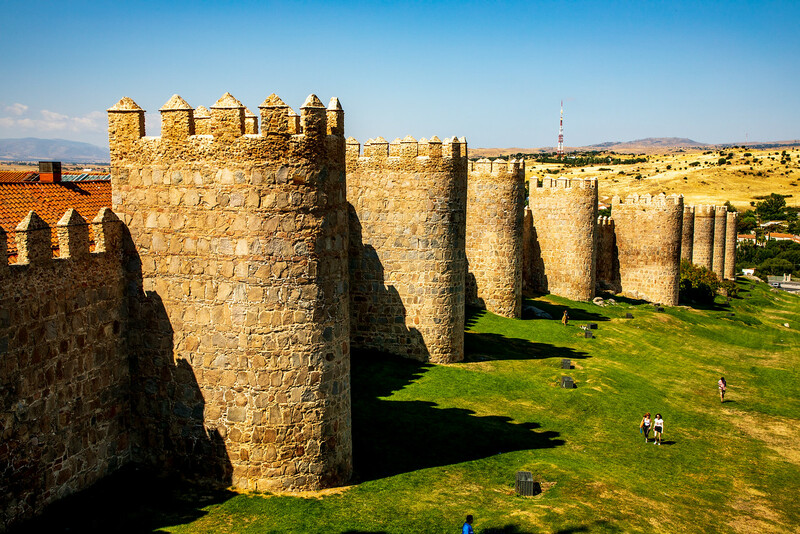 Avila is also one of Spain’s six UNESCO World Heritage Sites. Small enough to walk around, all of its major attractions can be found within the walls of the old city or just outside the city walls. We enjoyed wandering the streets, admiring the architecture and hunting down the good tapas bars. When we were there, there was a cute artisan market just outside the main gate to the city with views over the Sierra Gredos Mountains. The main gate to the city, the Puerta del Alcázar is rather impressive and leads to Avila’s cathedral. Avila Cathedral is an interesting mix of Gothic and Romanesque style and work on the Cathedral began as early as 1099 but wasn’t finished until the 14th century. It was initially built to serve as both a cathedral and a fortress. It also has a museum which is supposed to be quite interesting but it was getting towards dinner time, and our minds were more focused on food rather than history. Before we left Avila the next morning, we took a walk along the medieval city walls. Ávila’s city walls are considered to be one of the best preserved medieval walls in Europe, and they were pretty cool. At night, to add to the charm of the city, the walls are illuminated. The city walls were built in the 11th century by Moorish prisoners under the order of Alfonso VI after the conquest of the city in 1090. Avila’s Medieval City Walls are open every day for visitors except Mondays and costs €4 per person. Free for children under the age of 8. There are many restaurants within the city walls. Many of these restaurants seem to be catering to tourists and were a little bit pricey. The tapa bars where the locals eat were just outside the main city gate, and we wished we had eaten there. We actually ate at the Soul Kitchen inside the city walls (if only I listened to my own advice!). The restaurant looked great, was packed, had great reviews on TripAdvisor, clean toilets but really was just a fancy burger joint. The burgers were nice, but you don’t go to Spain for burgers! We stayed at the four-star Palacio de Los Velada. Lovely little hotel overlooking the Cathedral in the heart of the old city. We booked early on Booking.com, and it only cost €60 a night, and that was in high season, but there are hotels and guest houses in Avila, Spain to suit all budgets. 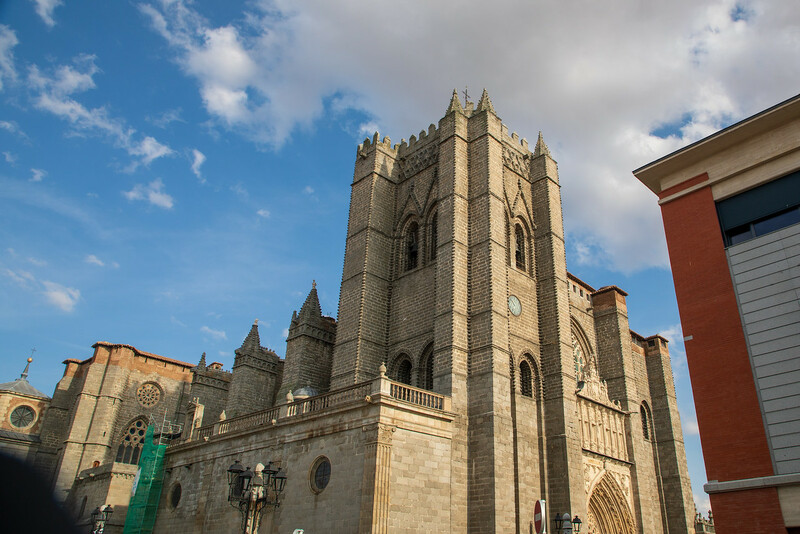 We visited Avila, Spain as part of a road trip from Portugal to France. However, for those in Spain without their own transport, there are regular trains and buses from both Madrid and Salamanca to Ávila. The journey time is roughly one to one and a half hours. Next stop on our way to the Canal du Midi, Zaragoza. Ohmigosh! Those gorgeous city walls! This will sound silly, but I always associate walled cities with Germany (and for some crazy reason only Germany). That’s probably because that’s where I experienced them most. However, it makes sense that many towns (okay, probably ALL towns) had walls like this for protection back in medieval times. There’s some amazing castle towns all over Spain and also Portugal. Avila is my new favourite! I’ve never even heard of Avila but would love to visit it now after reading this! I love the drone photo – so cool! I hadn’t heard of Avila until recently either. It’s a great place to visit and really easy to get to from Madrid. This reminds me of Siena, Italy so much! Love the medieval walls and that courtyard looks so beautiful! Wouldn’t mind being there right now. Spain just went up on list of must visit places! Thank you for the post..! 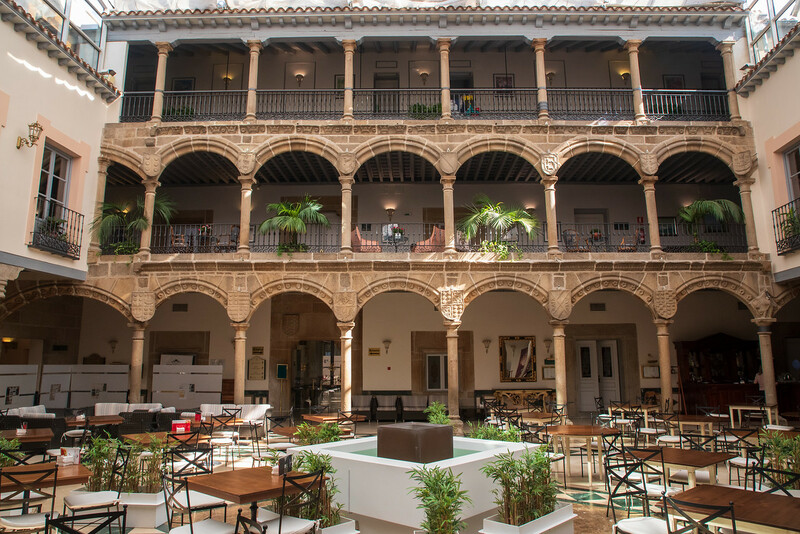 There are some great places to discover in Spain, you must go! I love the Medieval Walls! I’ve been to a few Spanish towns but have never visited Avila. I hope I get to visit there. I think I need a year in Spain at the very least. A year in Spain would be amazing, if only! Love your pictures! I have never seen city walls like this, such an incredible place. Thank you, yes it was an incredible place to visit. Avila reminds me of the medieval towns in Tuscany! I haven’t been to Spain yet, but this definitely looks like the type of place I’d want to check out. So pretty and historic! Now you’ve made me want to visit Tuscany. The bucket list never stops growing! What a beautiful small town. I would love to walk along the medieval city walls and see them at night when they are illuminated. Sounds like a great day tour! It is! You must try and visit!! The city walls are UNREAL! Sooooooo beautiful! Definitely adding this to my bucket list. I had never seen Avila before! It’s a lovely place, you should visit!